The Greg Norman Lancaster Zip polo is a seasonal style from the Regency collection. 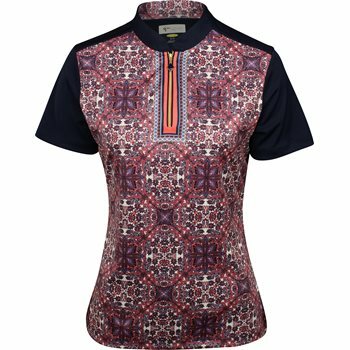 It is designed with a zip placket, a mandarin collar, and an engineered bandana print. The polo features lightweight fabric, UV protection against harmful sunrays, and Play Dry moisture wicking that draws sweat away from the skin for dryness throughout the day. The polo is made with polyester fabric that offers durability for machine washing so you can wash and wear as much as you’d like. The polyester also offers resistance against shrinking, mildew, and wrinkles.